Armed with a camera, you and your team become a member of the paparazzi as you take on a fun team assignment to snap photos of key locations and your team. Explore interesting facts about San Diego and its culture. If you don't have a team already, we will create one for you or register as a single contestant. 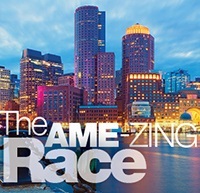 On Tuesday, October 30, 2018, The AME-zing Race will crown a champion. Will it be your team? Dinner is not included with this event, however participants are encouraged to dine together at a local restaurant afterward. No pre-registration is required - just meet in the Hyatt lobby.